The Chevrolet Orlando (Korean: 쉐보레 올란도) is a compact MPV manufactured by Chevrolet since 2011. The Orlando concept was a 5-door, 7-seat vehicle based on Chevrolet Cruze sedan. It included a two-tier grille, headlamps that flow into the front fenders and muscular fender forms that wrap around the wheels, 2.0L 4-cylinder turbo-diesel engine rated 150 PS (110 kW; 148 hp) and 320 N⋅m (236 lb⋅ft). It was unveiled at the 2008 Paris Motor Show, and later at the 2009 North American International Auto Show. In August 2009, at its extended product review, GM previewed the production-spec Orlando and confirmed its production. GM initially intended that the Orlando would go into production in the United States, however, in May 2010, GM reversed their decision. 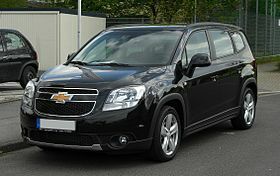 The Chevrolet Orlando sold in Canada starting in 2011 for the 2012 model year. This crossover is now being produced at the Gunsan Assembly Plant in South Korea. Orlando has been sold also in Europe since 2011. In 2010, GM showed the GMC Granite small MPV concept, which is similar to the Orlando. Production model was unveiled in 2010 Busan International Motor Show, followed by 2010 Paris Motor Show, 2013 North American International Auto Show. European model was available from 2011 until 2014 when most of Chevrolet's vehicles, except muscle and sports cars were permanently withdrawn from the European market, except Russia and CIS member nations. Later in 2015, Chevrolet Orlando was discontinued the Russian market. The model was discontinued for the 2015 model year in Canada. Diesel engine for Korean market has been updated in 2015 to meet the government's Euro 6 requirement. All diesel Chevrolet Orlando sold in Korea is equipped with 1.6 liter inline-four CDTi engine outsourced from Opel. Worldwide production of the Orlando is due to end in 2018, following its discontinuation by GM Uzbekistan, and the closure of the plant in South Korea which produced it. Canadian models included 2.4-litre direct injection petrol four-cylinder engine. European models include 1.8-litre petrol, 2.0-liter diesel engines. South Korean models include 2.0-litre LPG and 2.0-litre (163PS) diesel engines before update to 1.6-litre Opel diesel in 2015. As part of the Chevrolet Orlando launch in the UK, a life-sized Play-Doh clay model replica was unveiled in London. The second generation Orlando is made in China by Shanghai-GM. Available in 5 and 7-seater versions, the second generation Orlando was designed to be in a body style similar to a crossover. Power comes from a 1.35 L turbocharged three-cylinder engine producing 116 kW (156 hp; 158 PS). ^ a b "GM Uzbekistan stops assembling Chevrolet Orlando". ^ "Chevrolet Orlando: Freund der Familie". Heise. 8 December 2010. Retrieved 8 April 2016. ^ Phillips, Drew (11 January 2009). "Detroit 2009: Chevy Orlando Concept comes stateside, production version due in 2011 [w/VIDEO]". Autoblog. Retrieved 8 April 2016. ^ Elias, Mark. "On the scene: Some details from GM's product preview". Left Lane News. Retrieved 15 August 2010. ^ "2011 Chevy Orlando: Small SUV, Big on Space". U.S. News & World Report. 14 January 2009. Retrieved 15 August 2010. ^ "No Chevrolet Orlando for U.S., says General Motors". Nitrobahn. 1 May 2010. Archived from the original on 5 May 2010. Retrieved 15 August 2010. ^ "Chevrolet brings fun and functional European MPV to Canada with all-new Orlando". Archived from the original on 13 July 2012. Retrieved 29 May 2011. ^ Filipponio, Frank (19 December 2009). "Report: GM to show Chevy Orlando-based GMC Granite and hi-po Buick Regal in Detroit". Autoblog. Retrieved 8 April 2016. ^ Bowman, Zach (30 April 2010). "Buick LaCrosse rebranded as Daewoo Alpheon in South Korea". Autoblog. Retrieved 8 April 2016. ^ Ewing, Steven J. (25 August 2010). "Chevrolet Orlando production version unveiled ahead of Paris". Autoblog. Retrieved 8 April 2016. ^ Ross, Jeffrey N. (10 January 2013). "Chevy filling its NAIAS stand with 5 models not sold in US". Autoblog. Retrieved 8 April 2016. ^ "Chevrolet Orlando". Wroom.ru (in Russian). Retrieved 8 April 2016. ^ Cain, Timothy (4 March 2015). "Chevrolet Orlando Discontinued In Canada - No 2015 Model Year Orlando". GoodCarBadCar.net. Retrieved 8 April 2016. ^ Kim, Marie (2 December 2015). "Enthusiastic Response: GM Korea Sells 51,052 Units in November". BusinessKorea. Retrieved 8 April 2016. ^ "2012 Chevrolet Orlando". General Motors. Archived from the original on 15 January 2012. ^ "Euro NCAP results for Chevrolet Orlando" (PDF). euroncap.com. 2011. ^ Bowman, Zach (10 March 2011). "Life-size Play-Doh Chevrolet Orlando appears on London streets". Autoblog. Retrieved 8 April 2016. ^ "Toy racer: life-size Play-Doh car sticks to road". General Motors. 9 March 2011. Archived from the original on 2 December 2011. ^ "The New Chevrolet Orlando Is Not An MPV No More". Wikimedia Commons has media related to Chevrolet Orlando.